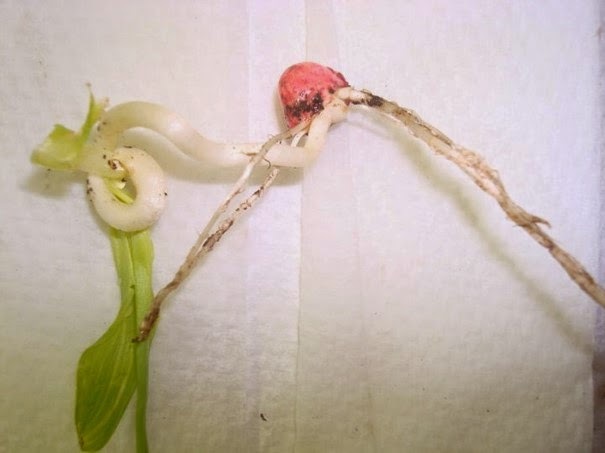 As a general rule, corn can sustain more injury (such as cold) because it’s growing point remains protected safely under the ground until around the V5 growing stage. Because of this, corn is more likely to recover from damage with little damage. However, there are always those exceptions and with corn this exception to the general rule can occur if corn sustains a lethal temperature of below 28 degrees for a few hours. If this occurs, the corn growing point can die, even if the corn plant is younger than V5 and the growing point remains below ground. You can cut the plant open and examine to the growing point to see if it appears brown; however, unfortunately, the only way you will really know if you have corn loss due to corn injury is if you wait a few days for signs of recovery. A corn seedling (in a less than desirable seedbed) showing stress due to cool temperatures; however later recovered later in the season. Also keep in mind, once the corn plant has sustained cold stress, it becomes much too susceptible to disease, pests, and even herbicide injury. Stand counts will need to be taken to determine if replanting should occur. Scouting for corn emergence problems is strongly encouraged early in the season so that prompt replant decisions can be made. Burrus provides an easy to use replant chart in their 2014 Growing “pocket” Guide on page 18. This replant chart can also be found at the Burrus website, (www.burrusseed.com), by choosing the Resources tab, then clicking on Reference Materials, and clicking on “Should I replant my corn?"